It's a custom to give little rhymes with your christmas presents, so that the reciever can guess what he or she is getting, before opening the package. My family has never employed this habit, but many people do. Lena is one of them. It was a block of Velveeta! I'm SO happy! I love fake cheese stuff - Kraft Mac & Cheese truly is one of my favorite foods ever. And I'm being serious here. (Might have something to do with it being virtually impossible to get here.) So, Velveeta.. thank you Lena. Great present! I have to make something really "worthy" with it. 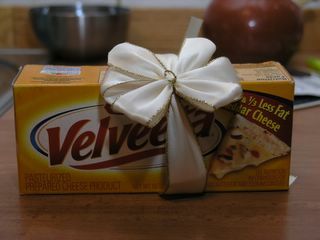 Haha I have always taken Velveeta for granted, but I can see why you like it. I am now wondering what Swedish brands I am missing out on in the states. OMG. I'm jelaous. I love quesadillas made on Velveeta. We always buy Velveeta if we are in the US, and also tell our friends to buy it for us if someone goes overseas. It's such a shame we don't have Velveeta and Mac & Cheese in Sweden! There are some things, like macaroni, that are just made for it. I also like Egg McMuffins (no meat). The blend of the sharp and smooth cheese food with the mild egg and crunchy English muffin is just the thing. My mom used to melt Velveeta on hot cauliflower for a quick sauce - good stuff. One of my favorites is to melt it on soda crackers (with margarine, not butter, please!) - a snack my dad used to make, and grilled cheese sandwiches. Oh man, all of those suggestions sound so good! :) Indyfoodie - I know, it *is* very fake. But very addictive.. we have tons of cheeses in Sweden, all kinds really - but all are "good" kinds. Nothing fake. In fact, I doubt the strong colors are even approved here. Cybele - I love Egg McMuffins. It has occurred to me to try my own - sounds like I really should. I have to start out by making muffins though.. or just use toast.